The Yarra Valley Bonsai Society, based in the 'far east' of Melbourne, caters for bonsai enthusiasts of all skill levels, from the simply curious and absolute beginner to the advanced practitioners. Meetings are held on the second Tuesday of each month at Chirnside Park Community Hib at 33 Kimberley Drive in Chirnside Park (Melway Ref 37 F3 or see map here). Monthly meetings usually begin with a Review/Overview session at 7.30pm, followed by a short business section and then a feature event: usually a demonstrator or speaker on a topic of interest. In addition to our monthly meetings, we hold informal workshops on the last Saturday of each month from 1-4:00 pm also at Chirnside Park Community Hub. For membership enquiries contact info@yarravalleybonsai.org.au or download an application form and send it to the PO Box listed above. Better yet, bring it along to the next meeting or workshop. Membership has its benefits, such as substantial discounts at selected nurseries and other businesses of interest, but visitors are always welcome. LATEST NEWS:With the arrival of some cooler days and the colder nights that we are currently experiencing, it appears that the trees have finally got the message that it’s Autumn. Some deciduous trees are showing signs of putting on their “colorful coats” of fiery red or golden yellow, and the foliage on the other species has freshened up after the warm summer dried some of them out. It’s great to see our bonsais are doing the same as their larger relatives. What a joy to see all this action being duplicated in miniature amongst our own bonsai collection. Deciduous trees that have been kept in sheltered positions over summer can now be brought out into the open for a little sunshine, this will encourage autumn color throughout the foliage - but watch the weather forecast for the odd unexpected hot day or warm wind. 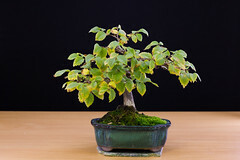 Remember also to turn your bonsai’s fortnightly, if they get uneven light This will ensure next years buds will develop more evenly around the tree. Other tasks you’ve employed over summer to protect your trees can be relaxed a little now too, but enthusiasts still need to continue the constant maintenance of their collection, if they are to keep it at its best. We announced last month that as of March 12th 2019 our Clubs meeting place would be the Chirnside Park Community Hub, located at 33 Kimberley Drive, Chirnside Park. (Melway:37 F3) With the growth in our membership and plans for future development and expanded programs, a larger more appropriate meeting place was needed. Our new venueis a well-appointed modern facility that is only a few months old.The location, size and appointments, meet our expectations beautifully. The committee has received many positive comments about the move and was encouraged to see the large turn-out of members at the first meeting there to check out our “new home” for themselves. The March Monthly Meeting featured a presentation and demonstration by Mark L titled Bonsai – Progression from Novice to Intermediate. Mark is relatively new to bonsai, with only about six years experience, but has enthusiastically embraced the hobby. He shared some great insights from his personal journey and experiences along the bonsai trail so far. He used a well-prepared power point presentation to support his informative, and sometimes, humorous talk. This session was of particular interest to our newer members, but also brought many comments and recollections from those more experienced members, which added to the interest of the presentation for all. Our April Monthly Meeting on Tuesday 9th 2019 will feature a ”Team Challenge Cup”. Teams made up of our members that are present on the night, will compete against each other to create a bonsai from scratch in under two hours. Previous Challenges have proven to be great fun, and a learning experience for members at all levels of expertise. The March Saturday afternoon workshop will be on 30th March and the April Saturday afternoon Workshop will be on 27th April at our new Venue from 1:00 – 4:00pm. Remember, if you are interested in finding out more about our Club, feel free to come along to one of our Monthly Meetings or a Saturday Workshop and see for yourself what we do. You’ll be made most welcome.